These days I rarely go into a big-budget, franchise film knowing next to nothing about what I’m about to see. However, I was able to avoid all the trailers and promotion for “The Predator” and went into this reboot cold. And I’ve never watched any of the old installments – from the ’87 original with ARNOLD (the year 1987 is referenced heavily in this one), to the Danny Glover sequel, “vs. Alien” battles and 2010’s “Predators” with Adrien Brody. “Iron Man 3” director Shane Black then introduces a number of characters. 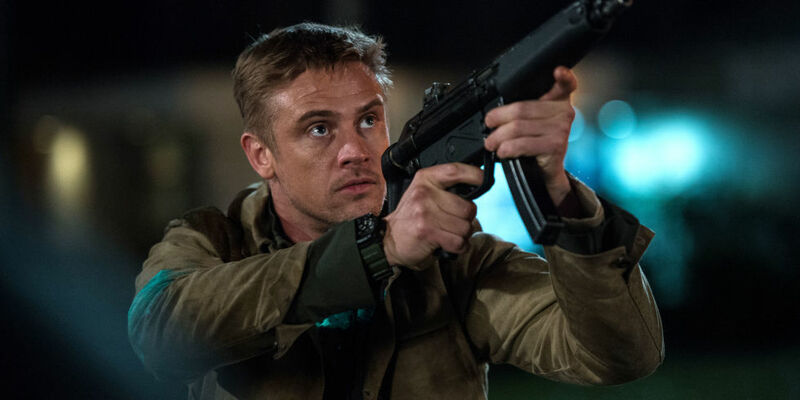 There’s Quinn McKenna (played by Boyd Holbrook). He’s a military sniper who encounters the spaceship when it lands and witnesses the large alien onboard. Because of this the government sends him to the looney bin – or more specifically, the looney bus, where he meets other soldiers who may/may not be mentally stable, including Keegan-Michael Key’s Coyle. He’s the jokester of the gang. Together they form their own version of “The A-Team” – and set-out to take down the aliens. Olivia Munn is scientist Casey Brackett. She’s brought-in to study the alien creature, but mostly to add a female element to this testosterone overloaded plot. 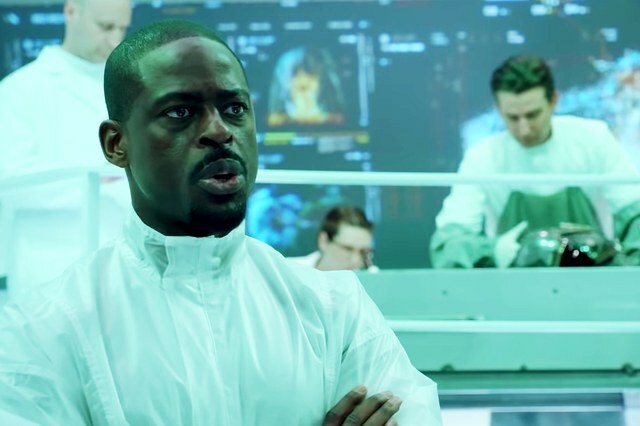 “This is Us” Emmy-winner Sterling K. Brown plays the Mentos chewing Traeger, the boss of “Operation Predator”, which has been underway since… 1987. McKenna’s son Rory, who’s on the Autism spectrum, receives a package from his dad that will draw him into this battle. He’s played by “Wonder”’s Jacob Tremblay. 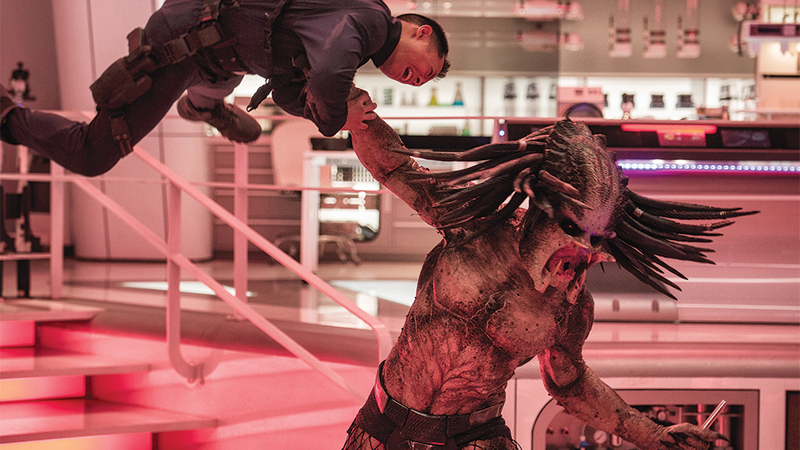 “The Predator” is easily one of the oddest movies of the year, thanks to its hokey action, unimpressive visuals and the intentional attempts at humor – most of which fall flat. It’s also ultraviolet and packed R-rated dialogue. Even the 11-year old Tremblay drops an F-bomb. And that score, from composer Henry Jackman, who I interviewed last year, is a “Star Wars”/“Indiana Jones” take-off, on steroids. The cast is somewhat likable. It’s just too bad “The Predator” script, co-written by Black, is way too standard. There are no surprises, including the predictable and rather lengthy cliffhanger sequence which sets-up a sequel. I give “The Predator” credit for being true to itself. This is B-movie sci-fi corn. And on that level it’s enjoyable. Just don’t expect something (r)evolutionary. On The Official LCJ Report Card, “The Predator” gets a C+.